Tagline: If God were John Galt, Chetan would be Ayn Rand. This is the third Chetan Bhagat’s book that I happened to read after five point someone and the latest temptation (I wouldn’t like to call it a sensation, Sorry, ardent fans of Chetan Bhagat) Revolution 2020. Five point someone was so realistic and Revolution 2020 was so filmy that I did not feel like writing a review. ONACC has however provoked me to showcase my mental prowess, and here it is. Chetan Bhagat is travelling from Kanpur to Delhi when he comes upon this interesting girl who narrates him a story on condition that he writes it as his next book. And thus begins the story. The story is a first person narration by Shyam, the protagonist. The story is about 6 members of a call center in Delhi and the incidents that happen to them in a single night while ON DUTY. Shyam Radhika, Priyanka, Vroom, Esha and Military Uncle. They have been leading their own happy lives despite some disturbances when a few incidents on that night unravel some horrifying truths in front of them. A loyal wife getting to know about her husband’s love interest, a ready-to-settle-in-life girl getting to know about her Ex eavesdropping on her phone calls, an ambitious girl turned psychopath revealing some dark secrets of her other career, a strict military man waiting badly to speak to his grandson, two very-hoping-to-be-successful guys knowing how they have been beaten by their boss’ wits, and amidst all these disasters happening simultaneously, they get into a car which meets with an accident and as they lose hope, they receive a call from GOD. 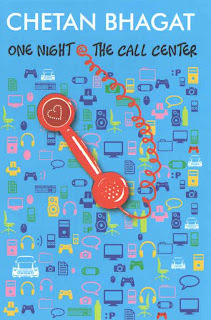 This book definitely gives us a feel of the lives of Call Center Executives and the issues they live with, in general. Aliased names and fake smiles, stressed lives and artificial foods, night Through the 6 main characters, the author tried to portray the various kinds of personalities. He also attempted to make the book a tool of self-help; the author invites the readers to think of aspects that make us angry and that we would want to change. Chetan tried to maintain the suspense of the ‘God’s Call’ till the end, It looked like he desperately tried to ape Ayn Rand, the way she maintained her John Galt’s Speech in Atlas Shrugged. However, the conversation appeared more mundane and rhetorical. The way he portrayed each of the characters suddenly realizing something and deciding to act on it appeared very abrupt. Well, it may so happen when someone comes across a life-threatening experience, however, the slot did not seem so convincing. To summarize, what starts on an interesting and a pragmatic note ends in a simple and impractical episode which seems unconvincing. ONACC is hence, a one-time read for those who just want to spend one of their sleepless nights.